Three-Time Christy Finalist Pens Another Winning Historical Romance Lucy Kendall always assumed she'd help her father in his candy-making business, creating recipes and aiding him in their shared passion. But after a year traveling in Europe, Lucy returns to 1910 St. Louis to find her father unwell and her mother planning to sell the struggling candy company. Determined to help, Lucy vows to create a candy that will reverse their fortunes. St. Louis newcomer Charlie Clarke is determined to help his father dominate the nation's candy industry. Compromise is not an option when the prize is a father's approval, and falling in love with a business rival is a recipe for disaster when only one company can win. Will these two star-crossed lovers let a competition that turns less than friendly sour their dreams? 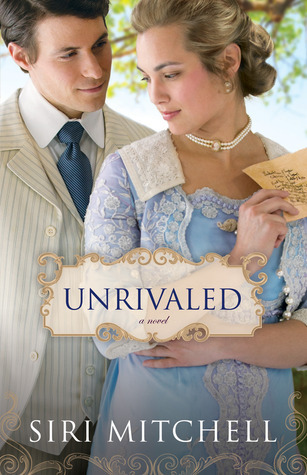 Unrivaled was the first book I had read from Siri Mitchell. I have heard wonderful things about this author and was excited to be part of this tour. Unrivaled is a story told in dual narration by both lead characters, Charlie and Lucy (by the way- LOVE these names). The passion between Charlie and Lucy was palpable. I loved that they didn't immediately just "fall in love" and that they both were far from perfect. I wish that the story could have continued on after the end of Unrivaled- I really wanted to know what was going to happen with this couple. The book left many questions unanswered, is it too much to hope that this could be a series? The author has a very lovely way to describe her characters. She has a great eye for detail- sharing what enhances the story without doing the dreaded "info dump". This was a solid read for me- one that I was so captivated by that I finished in one night. Fans of this author will not be disappointed and I am glad to have finally read something from this author!